Very seldom do I see a tool that I want right when I see it. Wait make that every tool I want when I first see it! But very seldom there is a tool that I think will really help me in the shop to become a better woodworker versus just something that would make things easier. If you think about it most tools that you have just help you do things faster and more efficiently. If you take a look at a lot of the “Hand Tool” woodworkers out there you can see that I really don’t need all the tools that I have and that most are just tools that I want. I mean the table saw you can do without if you have a hand rip saw. If you have a few good hand saws and a few sharp hand planes plus a couple of chisels you can totally do with out power saws and sandpaper. It may take more time but all you have to do is sharpen up that blade and go to work. I notice the dust that is created in my shop and I think a lot of the time that I should just do away with these tools! Then I come to my senses and realize I don’t have the patience or probably the strength any more to deal with that. So that brings me to what I am talking about in this post. I will preface this with I have no affiliation with Igaging and am not being asked by them to tell you about this gauge. I don’t even think you can purchase it yet and to look at all there other gauges I wouldn’t think it would be that expensive. If it was I might still buy it. By now you are saying to yourself “Tell me what the hell you are talking about!” Ok I will it is they’re new gauge for telling the depth or really the extension of the blade on your hand plane. Now I am a newb to the world of hand planes and would probably think this a gimmick, which it may be, if I wasn’t but I love the idea. I always have a hard time with getting the depth of the blade set on my plane. I always find myself getting the damn thing close and then going for that final adjustment to only go the wrong way and cost myself some more fiddling and some more change in the cus jar. Here is the link to the tool and please tell me what you think. http://www.igaging.com. I will be interested to know what some of you think about this tool and if you think it would be a good addition or just end up sitting around. The only other tool of there’s I have is the angle gauge which I use a lot and think it well worth the price. 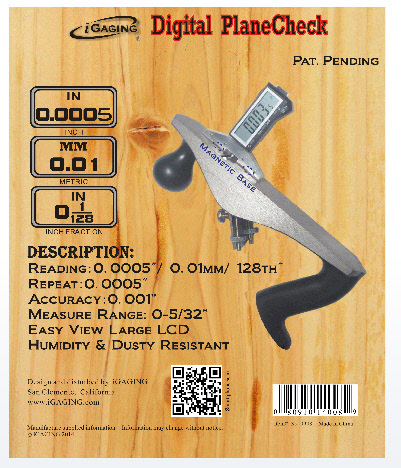 I do also have a digital marking gauge which I like but it is not there brand. It is just a HF knock off and it broke almost right away but I was able to fix it and still get some good use out of it. The HF way I think is that when you but something you know going in that you will have to either tweak it or out right fix it to use it. I use the marking gauge a lot and I am thinking of buying Igaging’s in the hope that it is of better quality. So I hope you find this article interesting enough to comment on it and like I said I will be interested in hearing what you all say. So as always “If I can do it So can YOU”! Previous Previous post: Whoa Nellie! Next Next post: Getting Cold!